Our bach is located right on the sand dunes at Pukehina beach, the beach is just a few steps from the front deck. 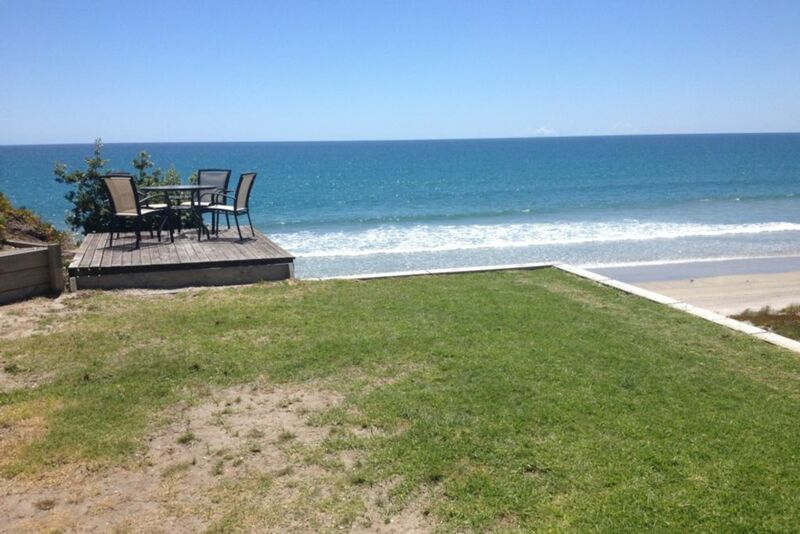 We have two decks, one situated on the front of the property that has extensive uninterupted views of the Bay of Plenty. The other deck is situated in a more sheltered area at the front of the bach itself, also offering great veiws, but without the North and West winds. The property is situated close to the local tennis courts, BMX track, walking track, kids park and the local shop is within walking distance. Pukehina beach has a ocean beach and an estuary which enables you to have a choice for swimming, kayaking etc, in all weather conditions. The beach offers surfcasting and kontiki opportunities for those keen fisherman. Two night minimum stay. Queen in room 1, Single over double bunk, king single and single pull out in room 2, Foldaway double sofa in lounge area. Smokers outside only. PLEASE NO PETS!!! A lovely spot for a real beach holiday. We weren't there long. Would love a week in summer. The only thing with a clean your own is that you are at the mercy of the person preceding you. No wardrobes or places to hang clothing as we were attending a wedding.,but otherwise clean comfy. Ooh so pleased you enjoy your stay! Congratulations on your wedding day. Wonderful family to have stay! Always leave the Bach clean and tidy. Definitely welcome to stay again. Another holiday in Pukehina Paradise! Another holiday in Pukehina Paradise! Could not ask for better facilities and better owners to deal with. Great place. Great bach. Great people! See you next year!